Though Another’s Fool is, I hope, well-crafted entertainment, its origin was serious: In contemplating a failed relationship, I thought it might prove illuminating to write it from the point of view not my own. It also got a serious, steady push from the passage of Shakespeare's Troilus and Cressida that suggested itself as the epigraph. But Caramoor being on my mind as I wrote—I was also working on my memoir I Remember Caramoor, and the Caramoor-inspired settings and characters of My Mad Russian had proved congenial not long before—I transposed the story to a fictional stand-in for it. 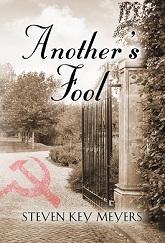 In broad outlines, the story of Another’s Fool was inspired by Mrs. Lucie Rosen’s hiring someone from the Sol Hurok Organization in the early 1950s to establish her Caramoor Festival. But that’s it; its events and characters are made up. Unfortunately, I never met Hurok and don’t recall that he visited Caramoor in my time, or even that I heard any stories about him, which is a shame as clearly he was one of the most interesting men in the country during the Cold War, in a unique position to bridge the U.S. and his native Russia. Bruce’s persecution by police and the FBI was suggested by the 1950s witchhunts of gay people, operations whose real harm is too easily forgotten. I knew a victim, a colleague at the white-shoe Wall Street law firm where I put in several years proofreading who had been fired from the State Department years earlier because he was gay (his intellect and culture impressed me when he declared the Off-Off-Broadway production of my adaptation of A Journal of the Plague Year to be better than Angels in America; I had to agree). As my narrator Bruce goes along, stuck on himself, but revealing himself, too, I hope readers will stay for the ride and not peel off, indignant and feeling deceived when Bruce reveals perhaps too much. That the story comes to so sudden and definitive an end delights me. What Bruce does next I have no idea, but I’m pretty sure he does OK.
Mrs. Berlin's West 54th Street music room resembles that of the Rosens’ city house, which I know from photographs; the room's elements were sent to auction after Mrs. Rosen’s death. Miss d’Orsay is based on the Miss D’Arcy of my Caramoor days, who, as an interior decorator, gleaned a small and entirely legitimate income from commissions on the purchase of various items. Miss d’Orsay’s father’s fate was suggested by that of a friend’s father who in fact was the structural engineer in the building of Columbia Presbyterian Hospital (as it used to be) and whose best friend was so keenly disappointed in Uncle Joe when news came of the Hitler-Stalin pact that he killed himself. The Colonial tenant cottage given Mrs. Ferenci in Another's Fool was suggested by the substantial Colonial house Caramoor rented out; I never was inside it. David Spegall’s red hair is that of a young pianist who spent the winter of 1971 living at the Rudels’ apartment, endlessly practicing there (I could hear him from the chauffeur’s cottage near by) and in the Music Room. It amuses me to consider that the FBI might have kept Mrs. Rosen under surveillance following her association with Dr. Theremin. After his mysterious departure from the U.S., Theremin spent the rest of his life developing state-of-the-art listening devices for Stalin and his successors, so it might be worth a FOIA request. But I have no reason to suppose her relations with Theremin took place anywhere but within the realm of art, and a wonderful thing about art is its genuine innocence. Interested readers might consult I Remember Caramoor for an account of my time there as teenaged-underbutler starting in 1970.